As expected, Samsung's Galaxy Tab is getting the lion's share of Android tablet hype lately, with a grand debut scheduled for September's IFA conference in Berlin. Samsung's Galaxy Tab has a 7-inch screen, and although one rumor suggested a mere 800-by-480 resolution, a more recent report from Chinese-language Web site ifanr -- complete with photos -- says the actual screen resolution is 1024-by-600. The tablet can be held in one hand, if your fingers are long enough (grab a CD case around the shorter side to get a general feel). From the video, there's definitely a big camera on the back of the tablet (3.2 megapixels, says ifanr), with a little dot next to it that's probably a flash. Samsung's teaser lists video calls as a feature, so I wouldn't rule out a front-facing camera, either. Navigation and mapping apps are shown in the video, so GPS is a safe bet. The same source that claims 800-by-480 resolution also said the Galaxy Tab has a 1 GHz processor and Bluetooth, based on leaked firmware. Samsung says Android 2.2 will be the Galaxy Tab's platform of choice, and confirms support for Adobe Flash. It's likely that Samsung will use a version of its TouchWiz interface -- like the one that appears in Samsung's Galaxy S phones -- but the teaser video avoids specifics. In addition, the video shows Swype support and an app called "AllShare," which looks like a way to sync with multiple servers and displays. Price and release date are big mysteries, but you can't expect those details before Samsung shows off the Galaxy Tab in full. There's also no mention of Android Market support in the video. The only footage of an actual Galaxy Tab in action was hastily shot on board a train in Australia, and didn't reveal much. 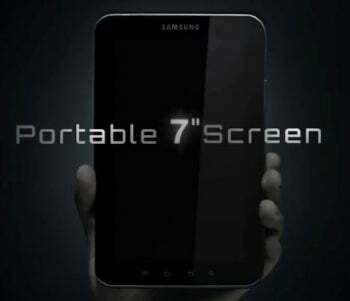 The Samsung Galaxy Tab's big reveal is scheduled for September 2.